The Pension Charges calculator enables you to compare the charging structure of different plans. Pension charges are an important factor to be taken into account when considering to transfer from one plan to another. 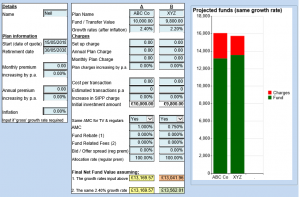 This can sometimes be difficult if the fund projections for each plan assume different growth rates. General details of the arrangement are input, such as when the plan is to start, end date, and contributions to be paid. Then specific details of each plan are input e.g. fund / transfer value, growth rate, the initial & on-going charges and whether these will increase. Final values assuming a same growth rate to enable a comparison. Final values also shown in bar chart format.